A Capitol Sound and Unforgettable recordings from Hollywood's beloved studio and landmark. When you think of Capitol studios in Los Angeles, nostalgic and timeless sounds like Nat King Cole's Christmas Song come to mind. Try "April in Paris" From the Verve "Ella and Louis" LP recorded in Capitol Studios on August 16, 1956 with Louis Armstrong, Buddy Rich on drums and the Oscar Peterson Trio. Frank Sinatra made 19 albums with Capitol 1954-62, with legendary arrangers Axel Stordahl and Nelson Riddle. Fast forward to 2002 and listen to some of the world's contemporary chart-toppers like Diana Krall, Everclear, Faith Hill, Goo Goo Dolls and Harry Connick Jr. all of whom record at the legendary Capitol studios. Capitol Studios shares the 50-plus-year heritage of one of the most American of pro audio success stories: Capitol Records. Capitol Records was the first record company based on the West Coast, and has promoted such acts as The Beatles, the Beach Boys, Pink Floyd, Frank Sinatra, Bob Seger, Duran Duran, Bonnie Raitt, Robbie Robertson, Steve Miller and Tina Turner, among many others. Today, Capitol Studios and Capitol Mastering have evolved into the Studio of the Future respecting the technology and creativity of the past and cultivating an adventurous spirit into the future. Utilizing digital and fiber optic technology along with quality vintage electronics and State of the Art room design, Capitol Studios and Mastering have broadened their scope as a leader in digital and global technology. As part of the EMI family, Capitol Mastering shares a history of advanced recording technology with great studios like Abbey Road, Olympic, the Manor and the Townhouse in UK. With collaborators such as EDNet and Rocket Networks producers can finally be in two places at once; reducing travel expenses and without work disruption. These technological advances are available to the music, film, TV and advertising industries through Capitol Studios and Capitol Mastering. Film, TV and advertising operate on a different pace with complex technical requirements. Directors want it done yesterday and in today's economy, film companies and producers diligently watch their budgets. Composers prefer the atmosphere of record recording studios which generally do not have film, TV and advertising expertise. 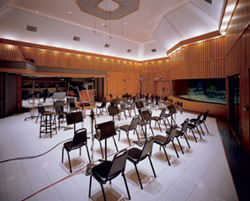 Capitol Studios offers an intermediate size recording facility from 4 to 75 pieces, with reasonable rates compared to commercial sound stages, with film, TV and ad professionals. Young Old Blue Eyes with Tommy Dorsey circa 1960. Engineer Schmitt worked in Studio A at Capitol during the Sinatra Duets sessions, during which Chairman of The Board Sinatra belted out his songs from the middle of a live orchestra, right in front of the horn section. 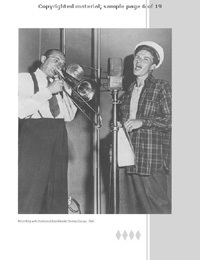 But while Sinatras parts were recorded at Capitol, many of his duet partners laid down their tracks in studios around the globe using the EDNet technology offered at Capitol. 2002 Tec Award winners R-L: Jeff Minnich (Capitol Records Studio), Al Schmitt (Engineer extraordinaire), Paula Salvatore (Capitol Records Studio) & Kirk Imamura (Avatar Studios). Watch Al popping in to Studio C with Studio Manager Paula to chat with producer Jimbo Barton! Also watch the Al Schmit interview from Capitol Studio A with studioexpresso. Multi Grammy engineer/producers Al Schmitt and Elliot Schinerare regulars here. Al who won his 11th Grammy earlier this year for Diana Krall's "Look Of Love" helped Robbie Williams croon like Frank Sinatra and Dean Martin on Williams album of Rat Pack-era swing standards titled Swing When Youre Winning. The album, recorded at Capitol Studio A on a Neve VR60 went to #1charts in UK, did double platinum in Austria and Germany and 10x platinum in Ireland. "On Krall's record I did a couple of fixes in Capitol Studio A, and then I mixed it at Capitol Studio C on a Neve," says Schmitt. Scheiner (winner of 2002 Pioneer in Surround Sound Award) mixed Queen ("A Night At The Opera")in 5.1. Recent mixes done at Capitol include: Dave Mathews - "Live," Richard Thompson - "Rumor & Sigh" and Wallflowers' new cd. 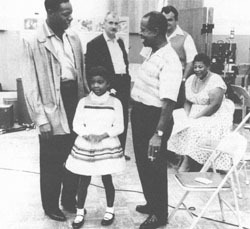 Natalie Cole (little girl) visits dad at Capitol Studios with Louie Arstrong and Ella Fitzgerald circa 1960. The Capitol Studio complex opened in a futuristic new building in the heart of Hollywood in 1956, and has since hosted some of the most treasured recordings in music history, from Frank Sinatra to the Beastie Boys. When Johnny Mercer, Buddy DeSylva and Glen Wallichs (pictured below) started Capitol Records in 1942 they had a vision to create a record label that would attract the greatest artists of their time. 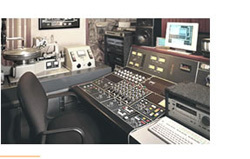 The way to attract great artists was to give them a unique sound and to achieve this they saw a need to build a state-of-the-art recording facility exclusively for music recording. A Hollywood landmark, widely known as the 'Capitol Tower', the building was designed by Welton Becket, noted architect. 13 stories tall and 150' high, the building is a modern, striking, earthquake-resistant reinforced-concrete structure. The ground floor, the only rectangular part of the building, is actually a separate structure which surrounds the tower and was joined to it after the entire tower was completed. It houses the Recording Department offices, two mastering rooms, three recording studios which were designed by Vincent Van Huff, Jeff Cooper, and Jack Edwards, plus six production/edit rooms. 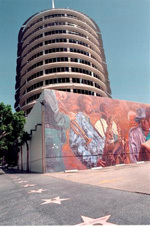 At the base of the building's southern face (overlooking a parking lot) is a large, colorful mural by artist Richard Wyatt, titled "Hollywood Jazz." The mural features large portraits of Nat King Cole, Billie Holiday, and other jazz greats. John Lennon's star on the Hollywood Walk of Fame is right outside the Capitol Records building, and is often the site of candlelight vigils on the anniversary of his death (December 8). After dark, you might notice that the spire high atop the Capitol Records building is topped by a red light which continually blinks on and off. The red light blinks out the word "Hollywood" in Morse code, every few seconds. When you are ready to work in a relaxed, professional atmosphere with a "let's get the job done" attitude, please make an appointment with Paula Salvatore to tour the great Capitol Studios and Capitol Mastering.